Back in July, the morning we left for church camp I found out my cat Taby was sick. A few weeks later I found out just how sick. She was 11 years old always looking for my lap and sleeping beside me in bed. Such a sweet cat. She lived only 2 months more after finding out she had bladder cancer. It was a sad two months. Not because of her health because she was doing well with the medicine they gave us, but it was knowing. Knowing it was coming. She loved the same but I loved more. More because I knew our time was short. We spoiled her more than usual. She got first dibs on the tuna can. I would sit just a little longer when she was curled in my lap. I cried a lot just thinking about the time to come. I know I should appreciate that time with her but it was also terrible watching her for any sign of being uncomfortable, wondering if we would know when the time was right, and hoping she would live longer than they said. Luckily, she was well until we knew it was time. (Based on signs the vet told us to watch for.) We had her put to sleep and it was so sad. The vet so nice. I watched Kevin from the house as he dug a hole to bury her in close to the wild roses that grow in the field. The morning fog still hung over him. We buried her with some roses. I picked. A sweet companion she had been. My friend Nina sent me this a few days later. She wrote this poem for me. She said the words just flowed to her out of Heaven. They are beautiful and touched me greatly. I did not know she wrote them until recently. Dear sweet Nina. Thank you. of my loving heart to rest. It was a very sad day. One I knew was coming but it didn’t make it any easier. I cried a lot that day. Losing a pet just stinks! 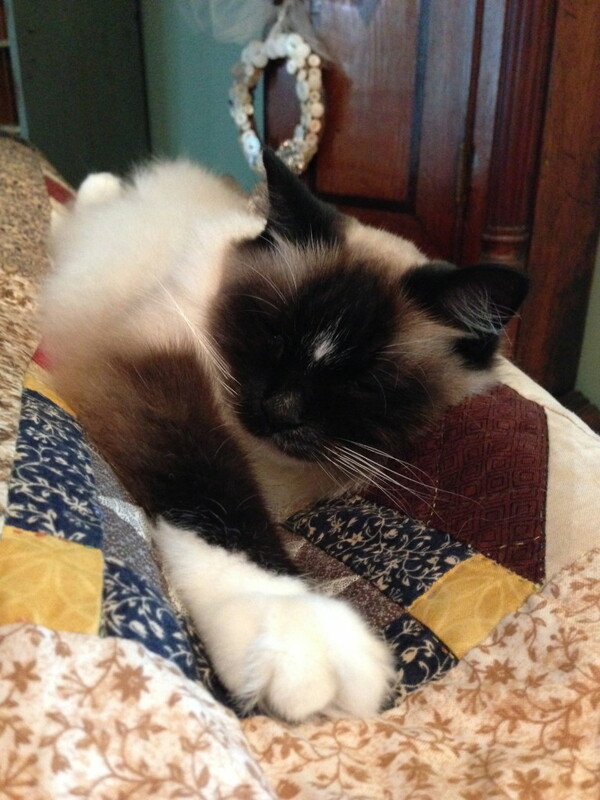 We thought our other ragdoll would come around with a sweet personality and fill the void that Taby left. Taby’s personality changed a lot when Toby died. She was always sweet but she really claimed ownership of my lap when it became vacant and became much more personable. So we had this hope for Sawyer. I put him in bed with us, he jumped down. I would set him a spot on the couch by me he would turn and face the other way. I wouldn’t see him all day. He didn’t care. I would call him. He didn’t come. He is full of himself! Two weeks later, while geocaching with friends, we were close to Animal Services and Brenda said let’s go in and see the kittens. No one argued. Certainly not me. In we went and looked at them and even held a few. We looked at the dogs too. One kitten was sweet. I drove back the next day to hold him again but I just didn’t feel a connection. I looked on pet finder and emailed a few breeders, checked the paper, and craigslist. My friend Philippa and I were headed to Cleveland because they had a calico kitten in their shelter but at the last-minute I changed my mind and we went to the Ark here in Huntsville, We went in the kitten room and Philippa would sit down and see who would come see her and before long she would have 4 kittens on her. They all loved her. I held many but none felt right. To make a long story short, we ended up back at Animal Services. They had a room FULL of kittens. There was a sweet lady in the room loving on kittens just for the sake of it. She does it every week!! We took over for her and loved on all 10 kittens and they even brought in 4 more and they were scared little things and we felt for them, scooping them up too for some lap time. We were there 1 hour! 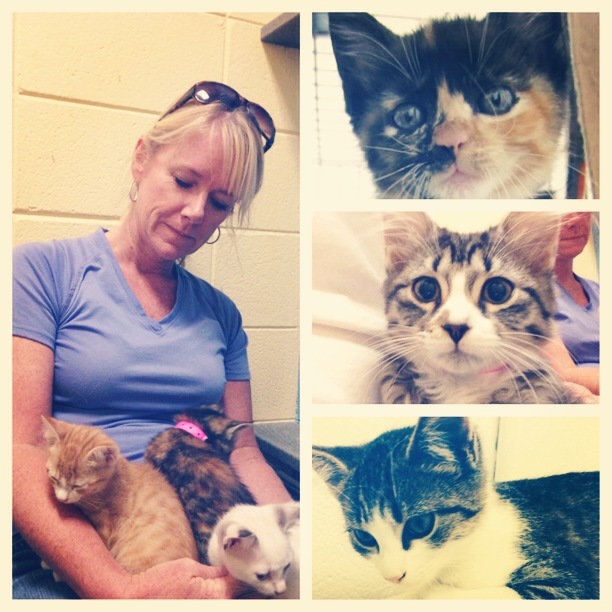 While there we met a lady who fosters kittens who are too young until they are ready to be adopted. I told her I was looking for a lap kitten. A really sweet one. She had fostered two that were there and I was asking which was the sweetest. She told me I needed the kitty she had at home but she wasn’t ready yet. I said tell me more!!! Philippa said my ears and head perked up. She began to describe the kitty and she sounded perfect. We decided to meet the next day with the kitty so I could meet her. She was 10 weeks old and just waiting to get spayed. 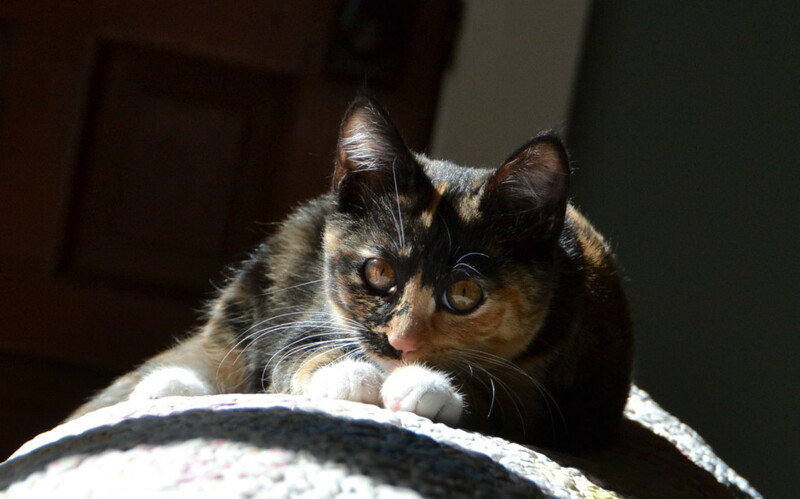 She emailed me a picture that night and she was a calico!!! 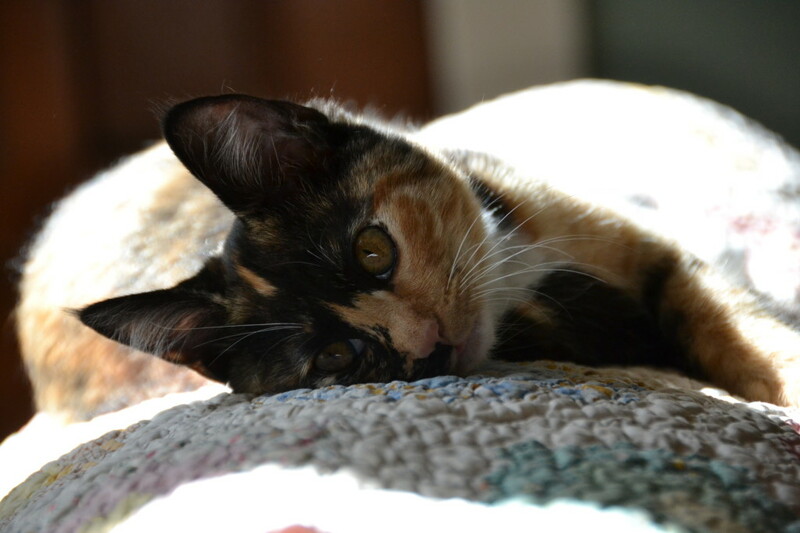 The next day we met and when I saw the sweet calico and she nuzzled her nose against mine and purred loud and strong I knew she was the one. 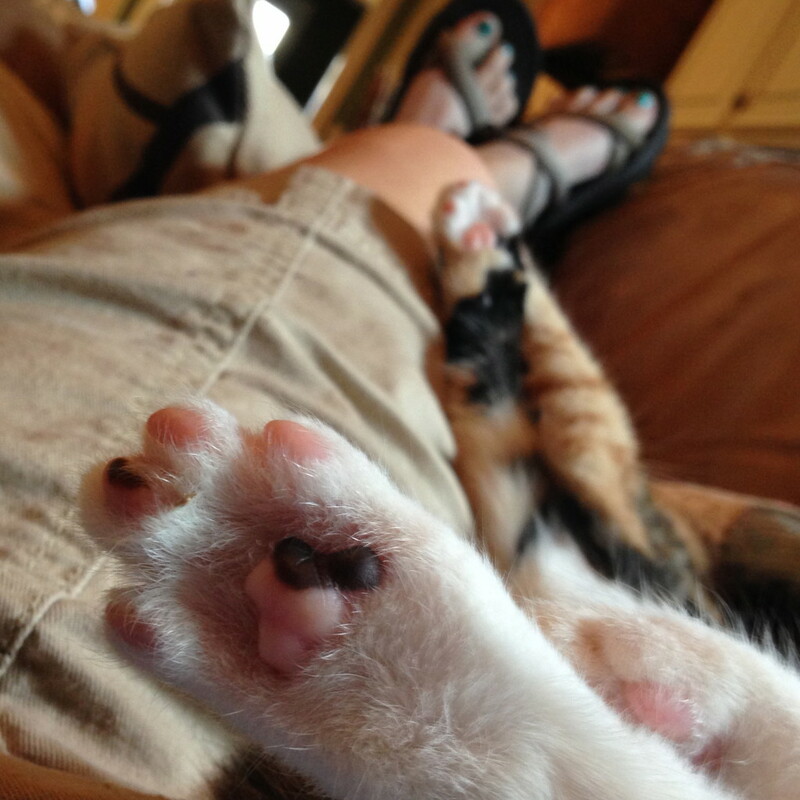 She would raise her sweet little paws when you pet her and arch her back to reach your hand. They let me take her then and I signed papers agreeing to get her spayed that Tuesday. Her foster mom cried when she put her in my carrier. I brought home a little spunky love bug. We named her Annie as suggested by Nina. Thoughts of little Orphan Annie made it the perfect name. 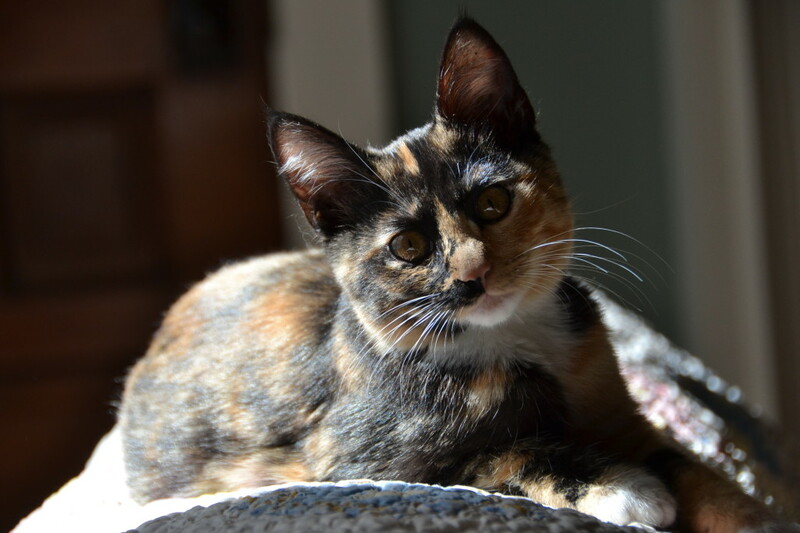 Annie and her sister were picked up by the animal services when they were 5 weeks old, plus she has that orange on her. She is so loving. if you are gone for even a short time she comes running to greet you and raises her paws to be picked up. 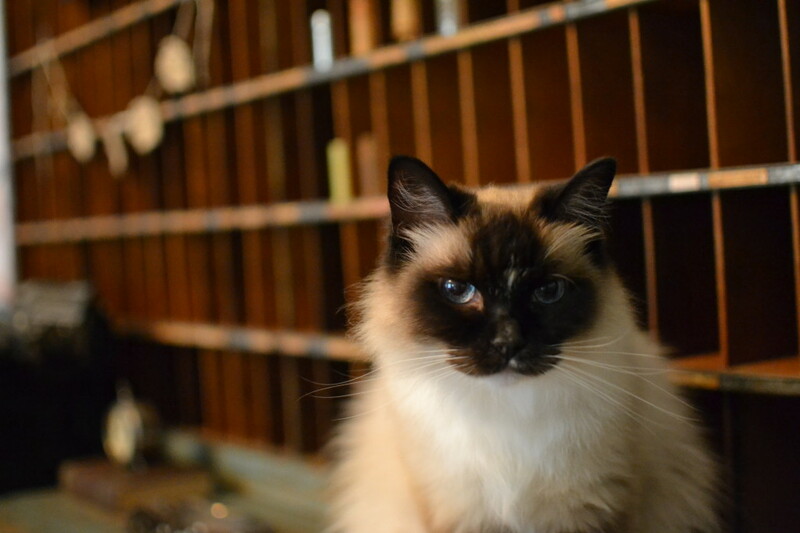 We say she is checking in, but she will jump up on you and nuzzle her nose against yours. Sometimes I get a 3 time pass. It’s just the sweetest. She seeks us out for her nap or just to sit in our laps. At night she sleeps between us curled in tightly. She is a little firecracker of energy but then so sweet too. And her face is so very expressive. Our first little nap together I was thinking about all the things that had to fall into place for me to even meet her and even know about Annie. I wasn’t even suppose to be in town that weekend. It just all worked out so splendidly. I would like to add that little Annie, when I started typing this, jumped up in my lap and has been asleep between me and the keyboard on my left arm. Every now and then looks up at me and stretches ever so sweetly toward my face. Having a kitten in your house is wonderful but having Annie has just been a blessing. PS. 2 months after Taby passed, the vet sent us a small box in the mail. 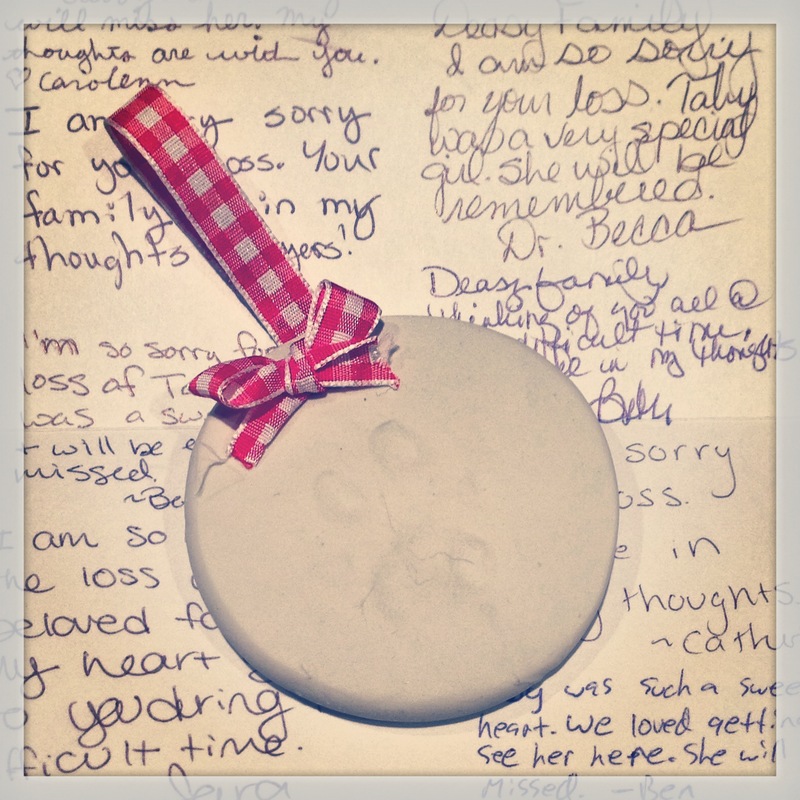 It contained a little clay ornament with Taby’s paw print pressed into it and her name on the back with a heart, along with a card with sweet notes of love and sympathy for our sadness from the employees. I can’t describe the emotions I felt, it was so very touching. My heart swelled with emotions again. Tears fell. I showed it to Kevin and he said this isn’t cheesy at all I think this is really sweet. This made me laugh. I took Jack to the vet recently and I wanted to thank them personally for it, but I felt the knot come up in my throat and my eyes start to sting. I guess I will write a thank you note instead. 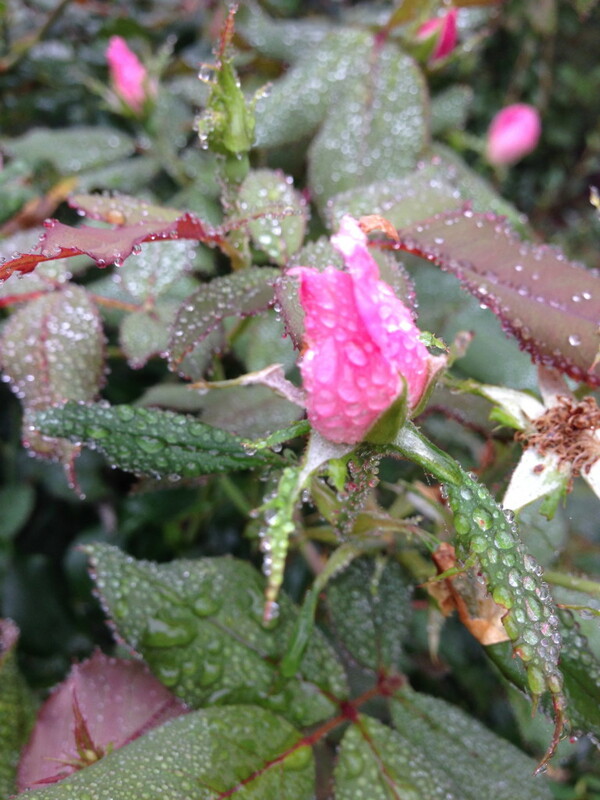 This entry was posted in Uncategorized and tagged annie, kittens, pets, roses by Katey. Bookmark the permalink. Your stories always touch my heart in some way, whatever the subject. This one about your precious Annie is especially moving. I love starting my day with you! I’m so happy for all three of you — you & Kevin for the joy Annie brings, & Annie getting a good, loving home! Another one of those unexpected little blessings that make life so sweet. You have such a beautiful heart and your writing is so sweet. Once again, you have captured the moment incredibly well with this story and your cute little Annie. I still remember the day I had to put our two cats to sleep. The younger one had cancer and the older one was 18 and fading. We debated whether to put down the older one, Tina. But she was the surrogate mother to the other one and we felt the grieving she would go through would just be cruel. I remember how much I cried digging their graves that day. But life goes on. And even though their earthly lives ended, their memories go on through us! Katey, this is such a beautiful memorial to a true friend. My kids and I have always taken in the stray and made them part of the family and we all seem to write about them after their death to deal with our own pain and to honor them and what they brought to our lives. I have old Geoffrey. Old Uncle Geoffrey is looking at 18 years old – He is thin and limps and I worry alot about him. That is a long time to grow our love for each other. Well, about two months ago I was feeding 2 dogs, 3 chickens, 2 adult cats and five kittens for my friend who was out of town. I didn’t little bit fall in love with two of them but whole heartedly fell in love with them. They are three months old now and a delight every minute of the day. And, the funny thing is how Uncle Geoffrey has perked up. I put his “old” bed down for them and he promptly claimed it back. He raids the kitten chow regularly. And he has more energy in keeping them away from his sacred places than he has in years. He will defend his old corduroy (really pretty – ugh!) stool to the death! What a blessing they are and how they find us! Annie knew you were hers the minute she saw you. Oh, you thought you had something to do with that? Sorry, doesn’t work that way. Enjoy your Annie and maybe someday she can meet John Henry and Richard Parker! 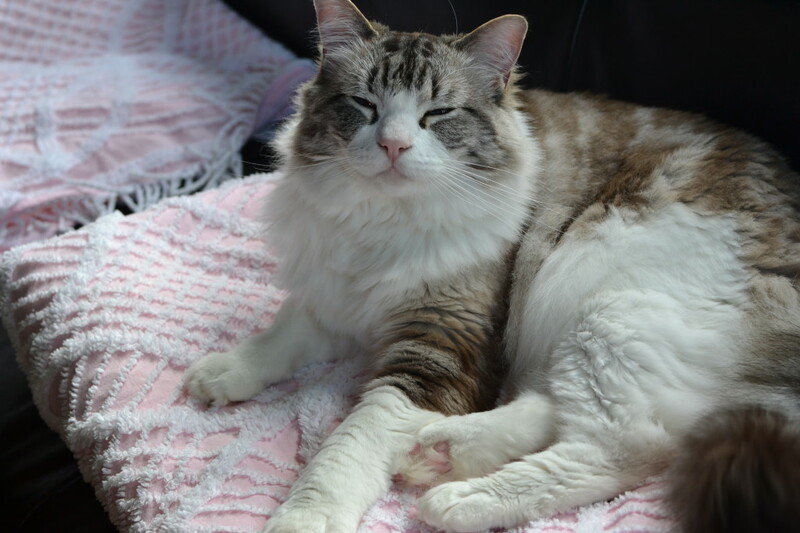 Alice, How wonderful to add John Henry & Richard Parker to your sweet life on the mountain. I know you find yourself just watching and laughing at them! I do so with Annie! Our 7 year old cat has become much more playful too. He hasn’t given in to the sweet Annie like we all have, but she’s working on him. She so wants to curl up in his soft fur & nap but he won’t have it!